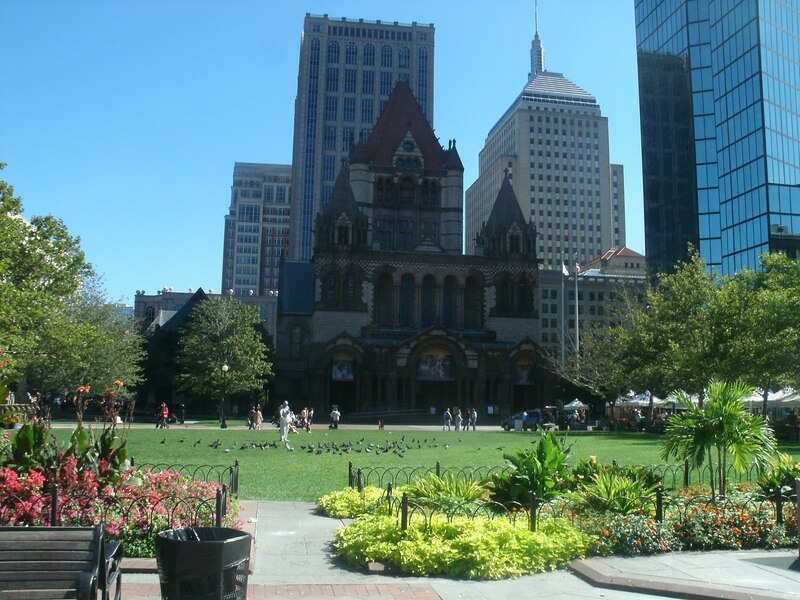 On the drop dead gorgeous last day of summer, I found myself in Copley Square soaking up the sunshine and the scenery. 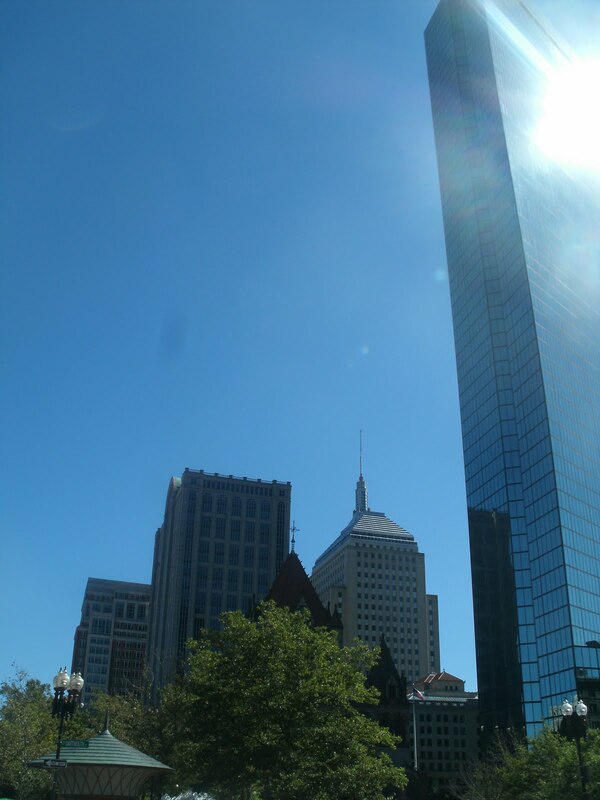 Boston is a very good looking city in the nice weather! 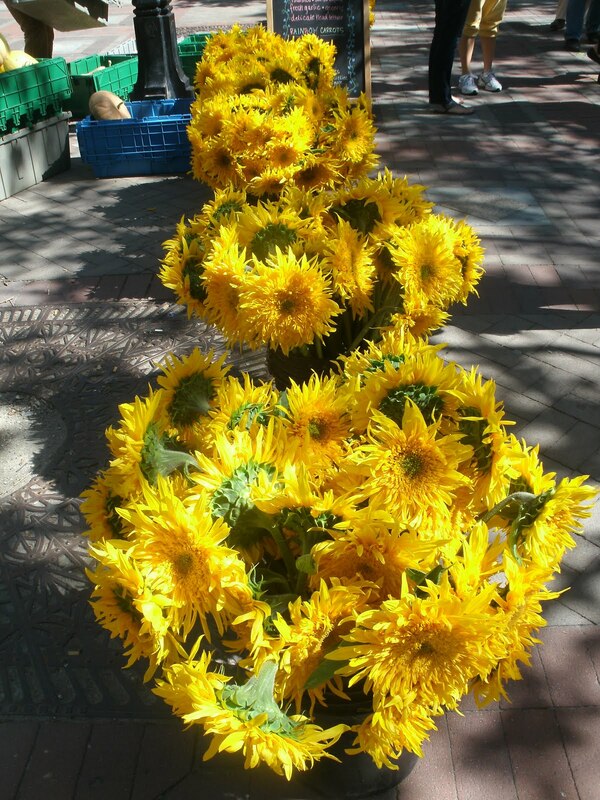 While perusing the farmer’s market in the square (which included these sunflowers), I spied something out of the corner of my eye…. 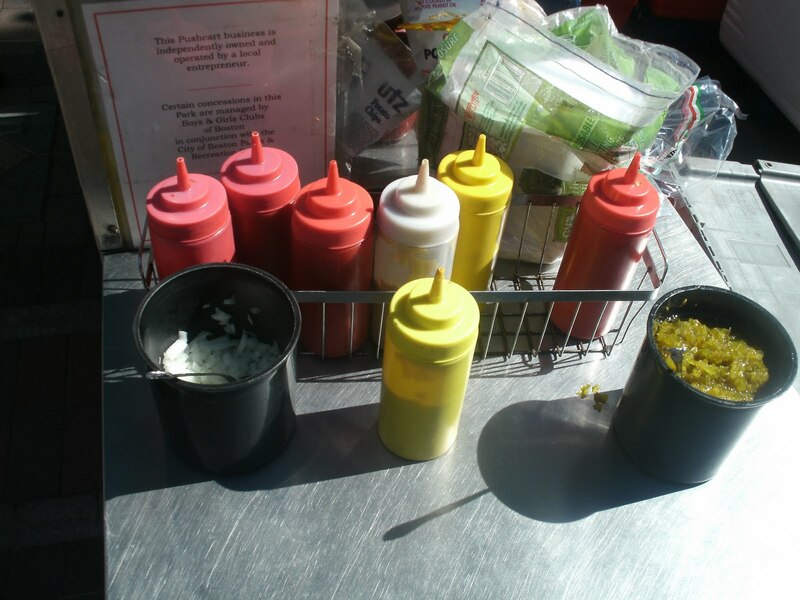 …a bustling little hot dog cart! 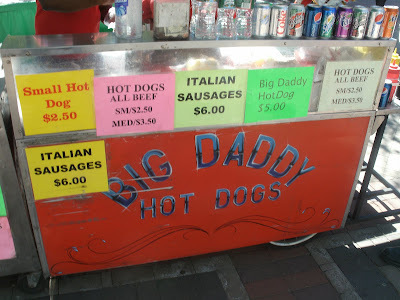 I had found Big Daddy Hot Dogs! I spoke with owner Doug Burrell who was being assisted today by his daughter, Jaquana. 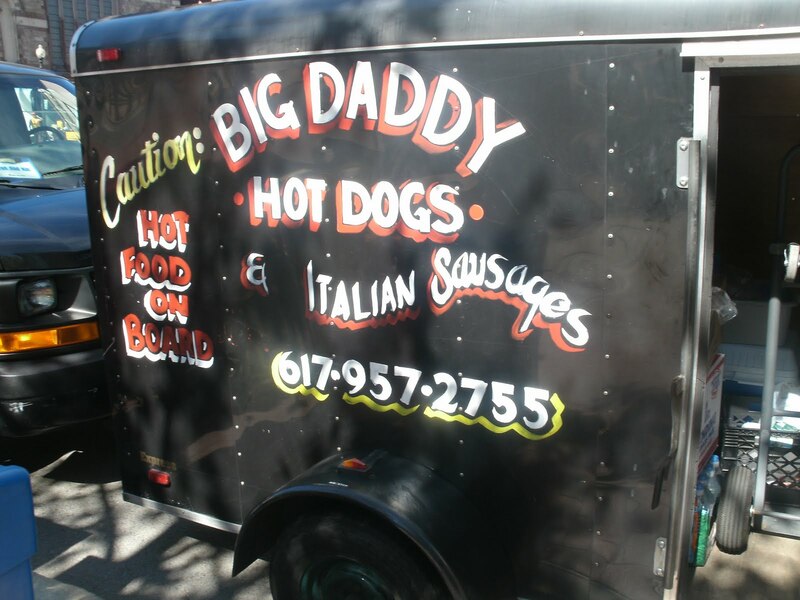 Big Daddy Hot Dogs is a family affair: Doug is the primary Hot Dog Man of the operation but he is often assisted by his wife or one of his five children. 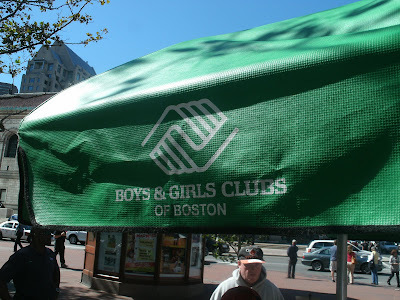 He’s even getting his grandchildren into the act- one of them starts helping out on Saturdays this fall. 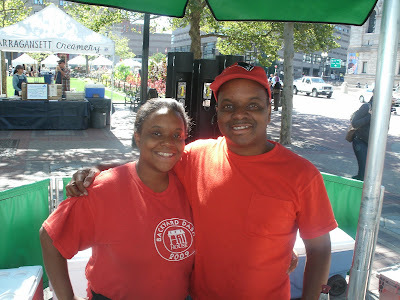 If you read this site, you know a lot of hot dog businesses are family run- something about the hot dog just brings folks together. Jaquana likes the food biz so much, she’s going to open her own bakery soon; I assume hot dog buns will be one of her products. 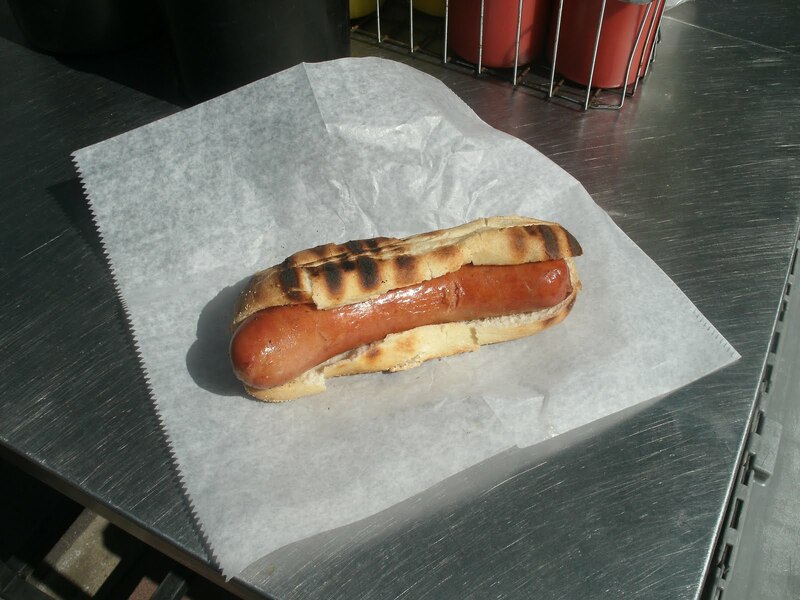 Doug got into the hot dog business by accident. He was working as a sales rep for a “major corporation” when he went shopping for a trailer to haul stuff around in. He liked the trailer, so he made an offer. 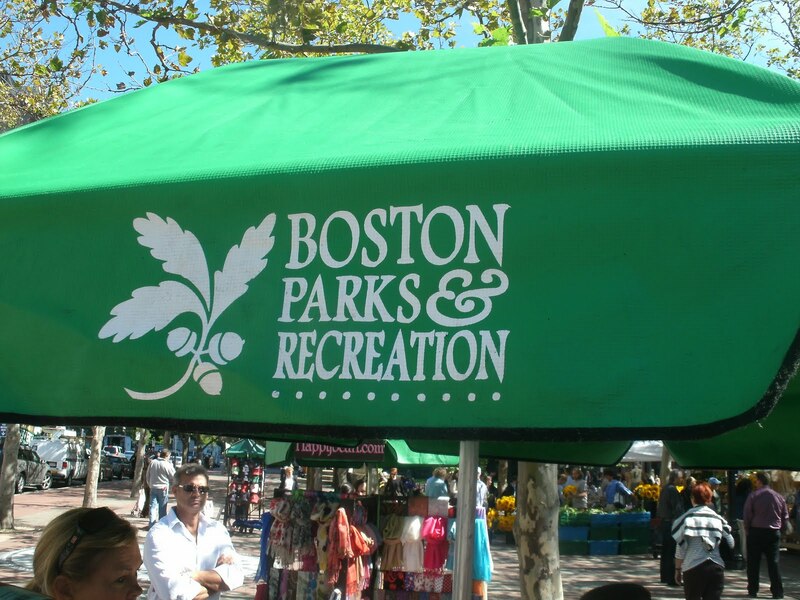 When he peeked inside, he found a hot dog cart. The guy he was buying the trailer from said it was part of the deal. Doug liked the trailer and the price, so he took the cart. He initially planned to sell the hot dog cart, but he set it up for a few Saturdays back in the fall of 2006 and he was hooked. Doug expressed some frustration with all the steps it takes to get permits for a hot dog cart in Boston, but he went through all the proper steps and secured his location. In Boston, the Boys and Girls Club administers vending permits as a means to raise funds. Big Daddy Hot Dogs is stocked with the standard hot dog cart accoutrements: chips, sodas and water. The standard hot dog condiments are offered for self service: brown and yellow mustard, relish, onions, and ketchup. The crowd was gathering, so I soaked up the sites while Doug served up the dogs. That’s the Boston Public Library in the background. 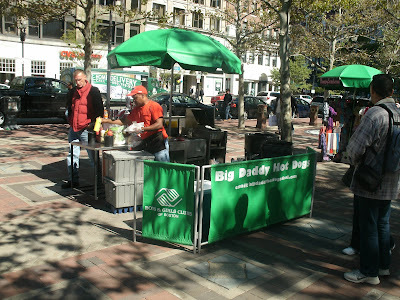 Big Daddy Hot Dogs is right across the street, on the corner of Boylston and Dartmouth street. What a fantastic location! 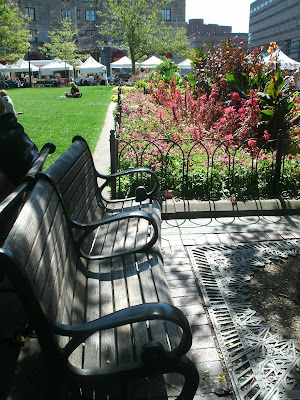 There’s TONS of foot traffic from nearby businesses and this is a hopping area for tourism and nightlife. THIS is what Doug sees every day! 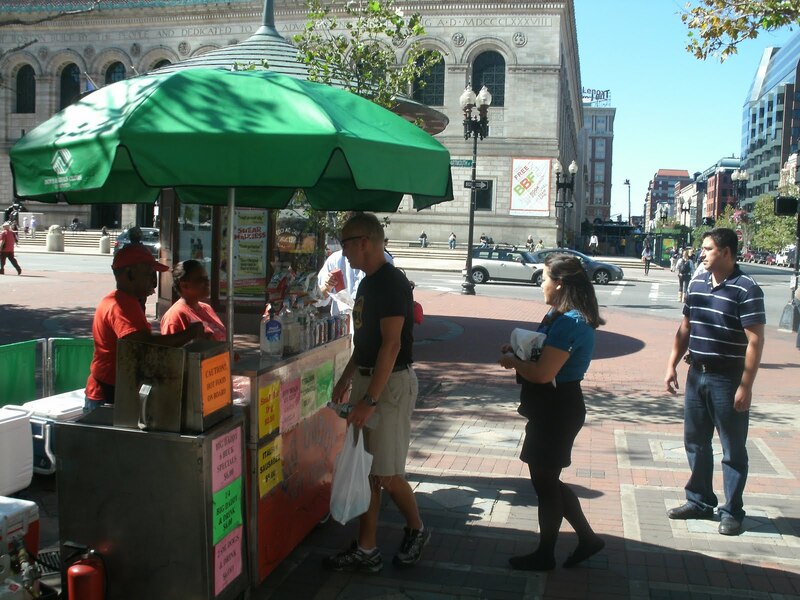 Copley Square is a great location for a hot dog cart! Doug is blessed to have such a high profile, high traffic location. He wants more though: he’s looking for some off season gigs and night time gigs in popular bar areas. While Doug and Jaquana cleared the line, I checked out the menu. 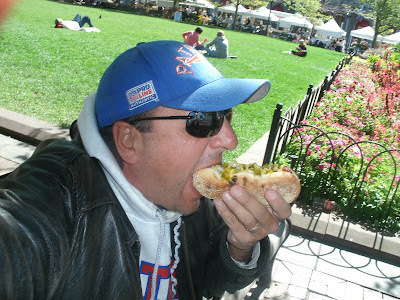 Doug also carries that ubiquitous staple of Boston street cuisine: the Italian Sausage. I was more interested in the hot dogs though. 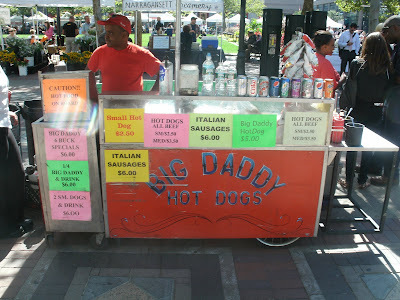 Big Daddy Hot Dogs serves three sizes of dogs: small, medium and the Big Daddy. The small dog is an Old Neighborhood Frank. The medium and large dogs are Pearl Franks. Doug steams them up and finishes them on the grill. He grills the buns too (a Hotdogman favorite). The small dogs are served on New England split top hot dog rolls. The medium and large dogs are served on a toasty sub roll! I went for the Big Daddy dog. This is the dog that named the hot dog business: Doug cooked the first one up and said “look at that big daddy!” The rest, as they say, is history. It IS a Big Daddy! That’s a quarter pound of hot dog there. Here’s my Big Daddy dressed All Around with brown mustard. There was an opening in the dining room, so I took a seat and…. 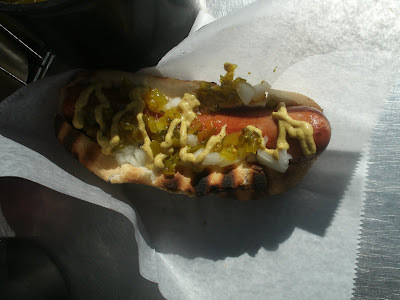 This was one satisfying hot dog! It was piping hot. The roll was hot and the dog was hot. The roll had a crispy crust and the inner bread steamed when I bit into it. The Pearl frank was juicy and snappy and spicy. Doug said he makes his Big Daddy Hot Dogs the way he likes to eat them and he likes his food hot. So does the Hotdogman. 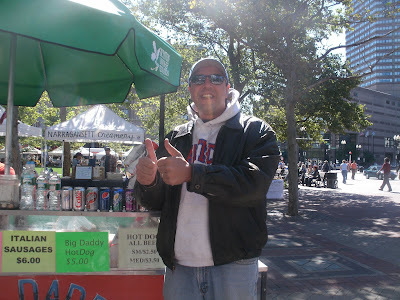 Big Daddy Hot Dogs gets TWO THUMBS UP!!! 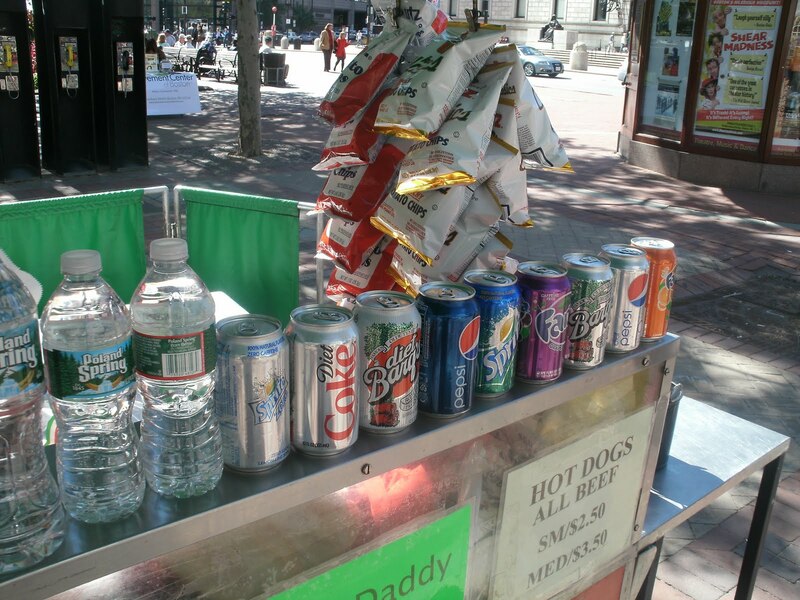 Doug plans on hanging on in Copley Square until winter gets too ugly; he’ll start up “sometime in March.” Like most hot dog men in New England, the “weather permitting” tag applies to Big Daddy Hot Dogs. 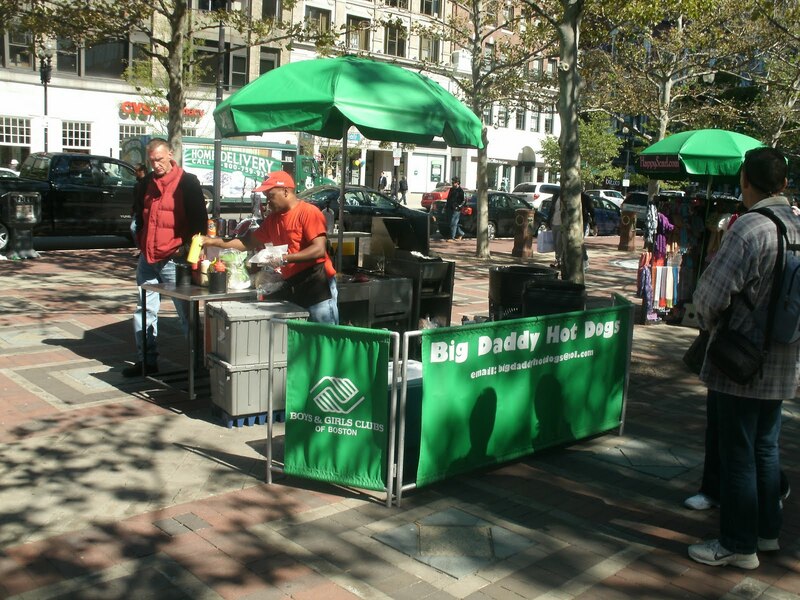 Whether you catch Doug and one of his rotating entourage of helpers before the Winter comes or next Spring, stop by for a Big Daddy Dog when you’re in the Copley Square part of town.